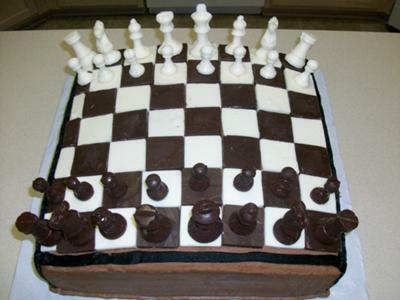 This chess board cake was made with marble cake inside with chocolate buttercreme layers and frosted with chocolate buttercreme. The cake was outlined with black icing for the top and sides and bottom border in chocolate buttercreme. I found one (1) candy mold to make the pieces, which I had to make several molds to get a complete set for both sides. The chess board was made out of white chocolate and dark chocolate candy. I used a square cookie cutter to cut the squares. This is hands down my best piece of work. Eight hours later and the chess board cake with pieces was born. The whole cake was totally edible. Hope you all enjoy. The bottom right hand corner of the chess board is supposed to be white, not black. Your board needs to be turned 90 degrees. Some of the squares are also too small. I used Wilton chocolate candy melts. what kind of chocolate did you use to cut into squares? I've been wanting to attempt one like that but never could find a mold. YOU DID AN AWESOME JOB!!!!!!!!!!!!! I am speechless.........so special, how I wish I have the mold too...well done. Awsome! Very creative. It's amazing what we can do with sugar, isn't it? Good work!